Corns usually form on toes and the sole of the feet. They are small, thick conical shaped circles of dead skin with a central point which build on areas of high pressure and friction. A soft corn occurs between the toes and is whitish and rubbery. They are commonly caused by wearing ill fitting footwear. Corns occur overlying a bone and they can also be a symptom of problems such as Bunions and Hammertoes. Calluses are hard and rough-feeling areas of skin that can develop on the foot anywhere there is repeated friction. 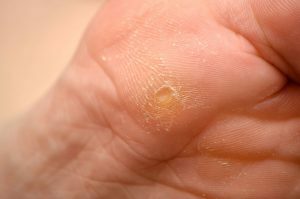 If you think you are suffering from Corns or Calluses then give us a call on 01386576128 or get in touch via our contact page to arrange an assessment to see how we can help you.